Oh happy day! Nothing spruces up drab fabric better than a dab of wool here and there. Iâ€™m envisioning felty wool flowers on skirts, rabbits on pillows and elephants on blankets! Wool is a wonderful material because you can add it to fabric* in almost no time at all and, as you wear/wash/use whatever it is youâ€™ve embellished, the wool continues to anchor down to the fabric. 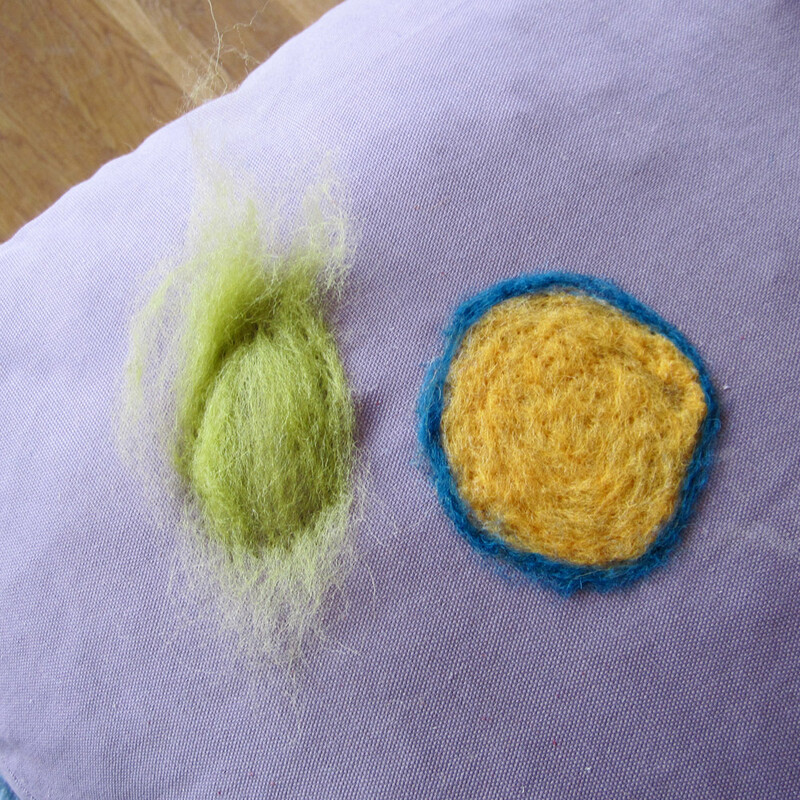 First, if you are going to needle felt onto a pillow take it out of the case if possible, otherwise go ahead and needle felt with the pillow still inside and ignore the instructions about the foam pad, the pillow form will act as your foam pad. ** Take your pillowcase/blouse/blanket/whatever and slip a piece of foam padding underneath the first layer of fabric. Your needle will pass through the wool and fabric and into the foam buffer. Next! 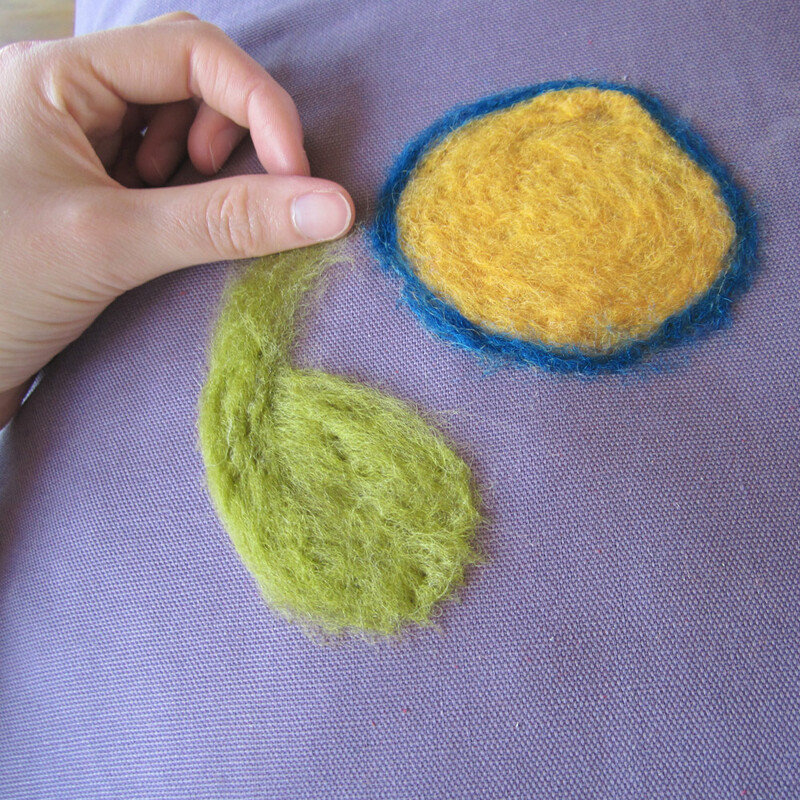 Gently open and spread your wool fibers into the general shape you want. In my case, I wanted a big yellow circle in the lower left corner of my rather large, boring pillow. 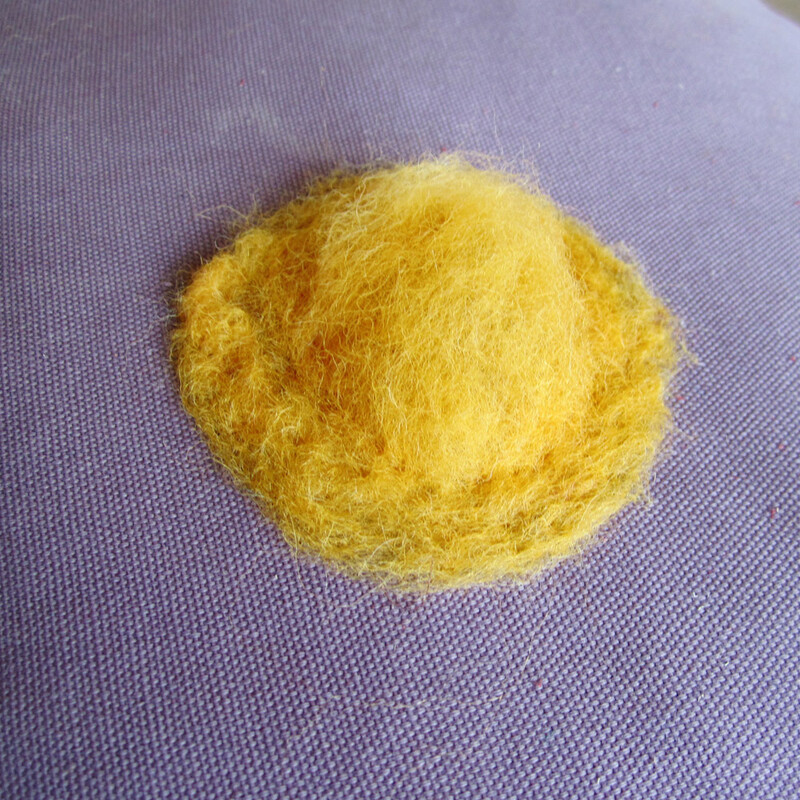 When your shape is where you want it start to needle felt around the outside of your shape. 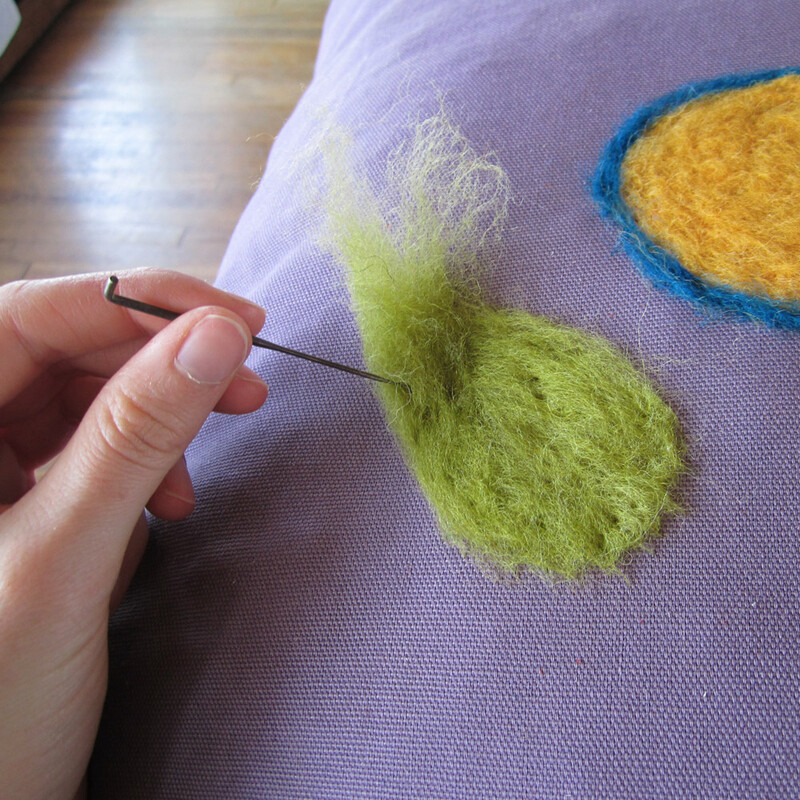 Start needle felting on the outside edges so that you maintain the shape you want. If you go from the inside-out your edges will be blurred and misshapen as the extra wool from the center mooshes out under the needle. 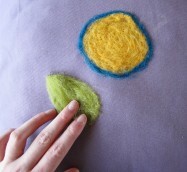 Make sure your edges are well and truly felted before you start felting in decreasing circles. 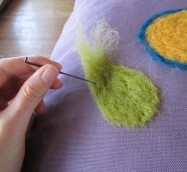 Youâ€™re done felting when you can use your hand to firmly brush over the wool and everything stays put. Next, I lightly finger twisted a small piece of blue wool roving and needle felted one end down as an anchor. 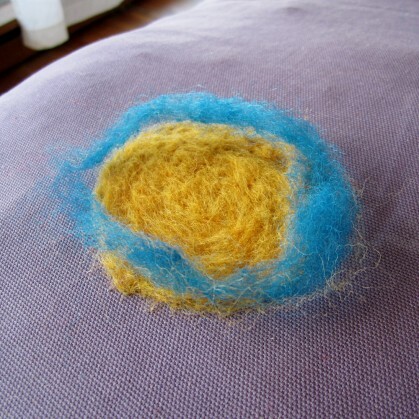 As I wrapped the blue wool around the yellow circle I anchored it down every inch or so to keep the shape I wanted and then went back around and fully felted everything down. Now, the leaves! 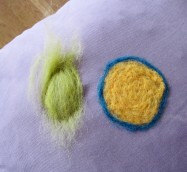 Shape your wool (into a tear-drop shape) and felt around the edges like you did for the yellow circle. 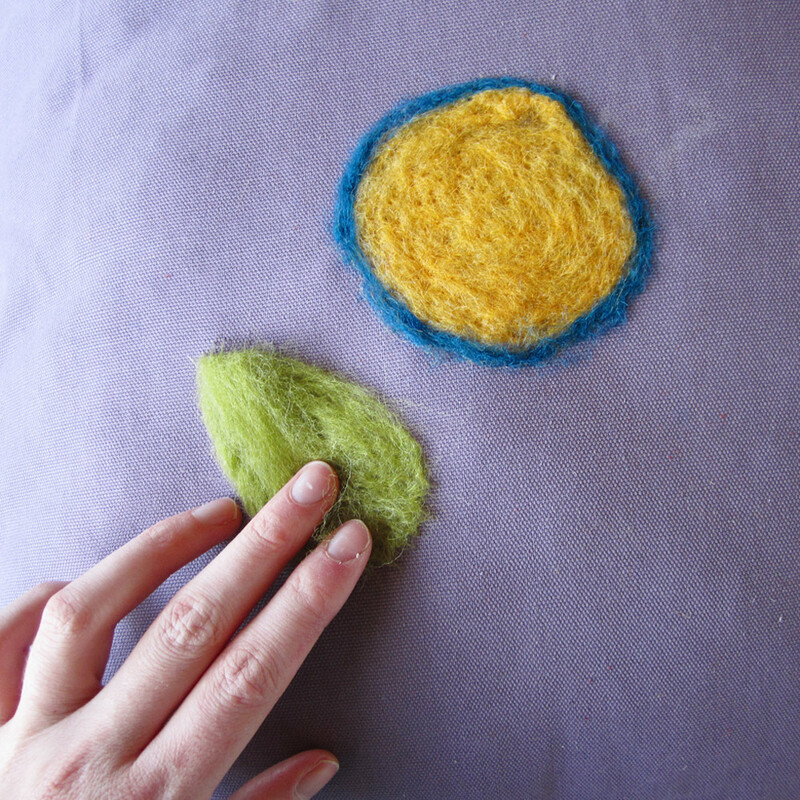 However, when you get to the extra wool at the point of your leaf, fold the excess down over the body of your leaf, following the contours of your leaf shape and felt it down as you gradually felt your way inward. Repeat for the second leaf. Last comes the stemmy bit. Finger twist a piece of roving twice as long as you want the final stem to be. 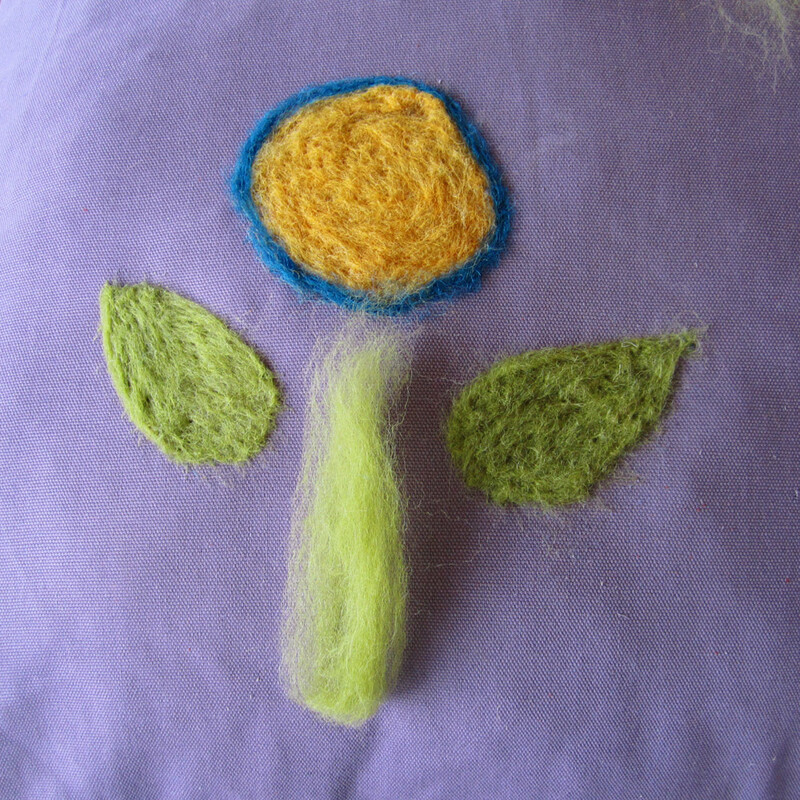 Fold the wool in half and tack the folded end below the flower, between the leaves. 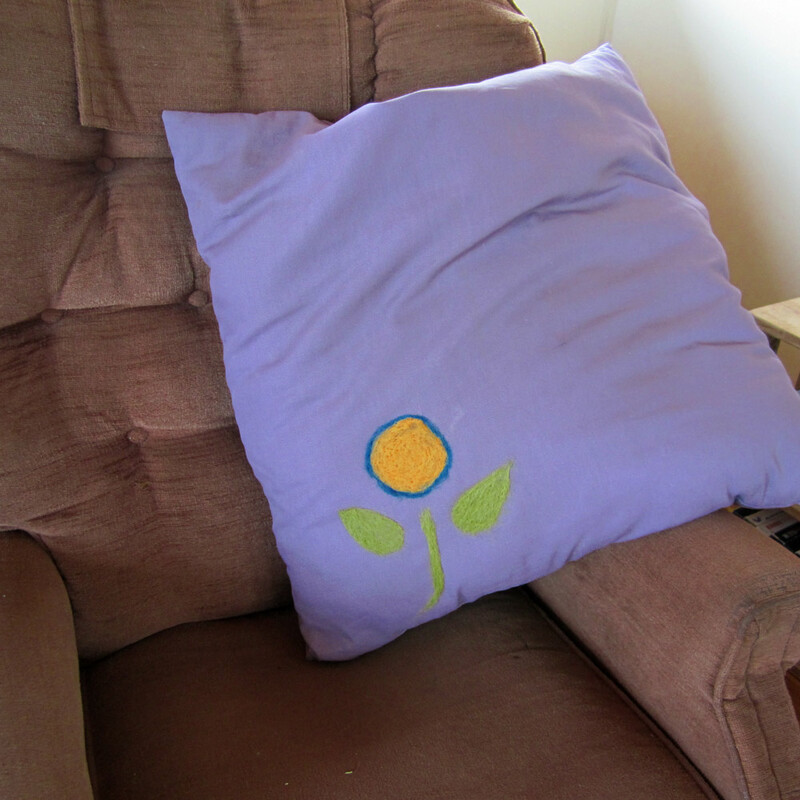 Tack the stem down to the pillow the same way you worked with the blue edges on the flower. Voila! 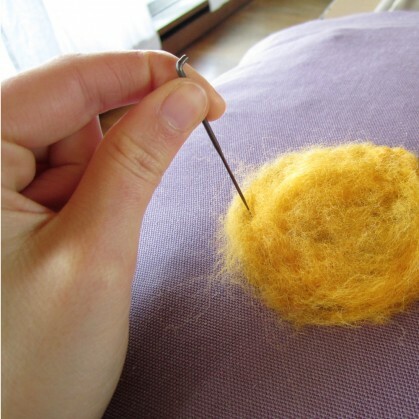 Use your needle to clean up and sharpen the edges of your design by using your needle at a steep 45 degree angle. This tucks in all of those stray wisps underneath the main body of your wool pieces. 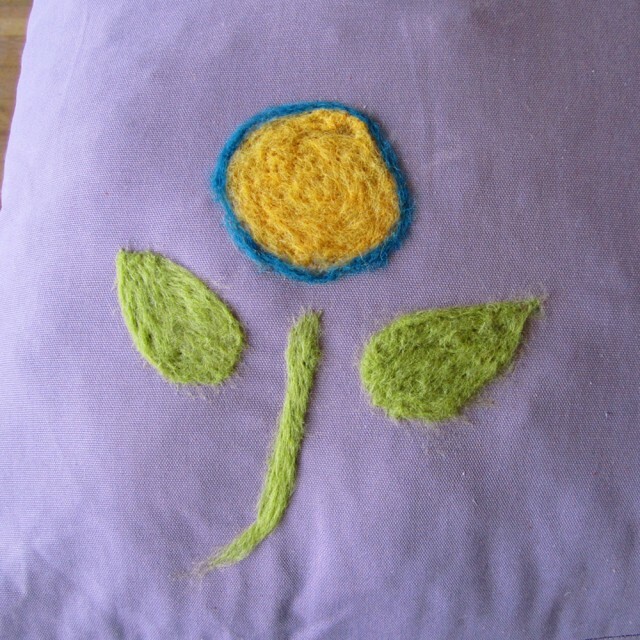 *You want to use a natural fiber fabric (cotton, linenâ€¦ etc). Also the more open the weave, the better because it lets the wool fibers through to the other side of the fabric. **In this tutorial I kept my pillow form inside of the case but I have written the instructions as if I used a foam pad because I think more of you out there will be able to take your form out.